REDWOOD SHORES, CA--(Marketwired - Mar 19, 2014) - AutoGrid Systems, a leader in Big Data analytics and cloud computing solutions for the energy industry, received the CODE_n Business Innovation Award at CeBIT, the world's largest international computer expo, for the company's achievements in employing predictive analytics and cloud computing to transform Big Data into the cheapest, cleanest source of power on the grid. The CODE_n judges cited AutoGrid's technical achievements as well as the commercial relationships the company has established in the energy industry as the basis of the award. AutoGrid's technology is being used by leading utilities such as Oklahoma Gas & Electric, Austin Energy and City of Palo Alto Utilities and the company has established strategic partnerships with leading organizations such as Silver Spring Networks, Schneider Electric and NTT DATA. AutoGrid was one of 50 finalists, selected from over 450 applicants from 60 countries, invited to participate at CeBIT in the CODE_n initiative, "Driving the Data Revolution," aimed at business models devoted to the intelligent and efficient handling of large data volumes. 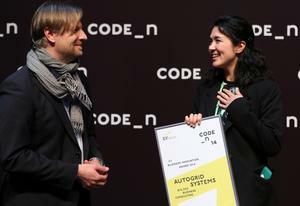 The Business Innovation Award at CODE_n was sponsored by Ernst & Young and Sandra Kwak, Director of Marketing and Ecosystem Partnerships at AutoGrid, accepted the award on behalf of the company. "AutoGrid is demonstrating the capabilities of big data to create truly positive change in the world," explained Ulrich Dietz, initiator of CODE_n and CEO of the GFT Group, and member of the jury of 10. "This technology is timely and necessary. AutoGrid has demonstrated an impressive speed to market maturity." AutoGrid is dedicated to bringing the power of Big Data, predictive analytics and Internet scale computational techniques to the production and consumption of electricity. Serving utilities of all sizes, grid operators, electricity retailers, ESCO services companies, and end-users, AutoGrid develops and markets services that both help lower costs and improve reliability of the electricity supply chain. "We are extremely pleased to receive this award. The electric grid is one of the most vital systems on the planet. Our technology is designed to help utilities, but also their customers, to get the most out of it," said Dr. Amit Narayan, CEO and Founder of AutoGrid. "Over the next decade, Big Data is going to have a tremendous influence on lowering emissions, making power more readily available to a growing population, and containing costs." CODE_n is an international initiative for digital pioneers, innovators and groundbreaking startups. Initiated in 2011 by the GFT Group, the goal of this network is to support outstanding business talents and their exceptional business ideas, provide them with a platform for dialog, and therefore stimulate and accelerate innovation in the field. CODE_n stands for "Code of the New," the DNA of innovation. The other CODE_n grand prize winner, is a London based start-up, Viewsy. The other companies in the final round of the competition were Sablono based in Berlin, Germany, and Munich startup, cosinuss. With approximately 3,500 exhibitors from 70 countries, CeBIT is the world's largest and most international computer expo and is considered a barometer for the state of the information technology field. AutoGrid Systems, a leader in Big Data analytics and cloud computing solutions for the energy industry, received the CODE_n Business Innovation Award at CeBIT.